Kevin J. Grant D.D.S., P.C. is the sole practitioner, and is compassionate about his work. You will always receive his expert care. Our emphasis is on healthy teeth and gums for the entire family. We offer conscious sedation and implants, specializing in stress-free treatment for all generations. Our staff understands that dental visits can cause apprehension for many people. We do everything in our power to make your visit as pleasant as possible. In his youth, Kevin J. Grant D.D.S., P.C. received inspiration from the father of a childhood friend – a local dentist. Always mindful of how hos interest in oral health was sparked by his dentist, Kevin J. Grant D.D.S., P.C. enjoys speaking to local students to both further their dental education and possibly inspire them to enter the dental profession. He has also volunteered his services in Haiti and New Orleans, providing free services to those in need. Originally from the Bronx, Dr Grant grew up in Long Island and Chicago. Educated at Suffolk Community College and SUNY Stony Brook, he received his Doctor of Dental Surgery degree from New York University in 1992. He has completed many continuing education courses, which allow him to remain updated on today’s dental options and procedures. 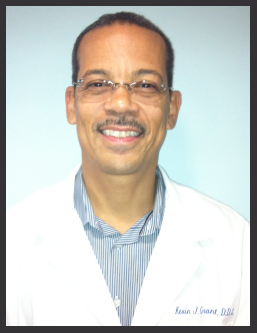 Since graduation from New York University Dr Grant has been practicing dentistry in Jamaica, Queens for over 20 years.